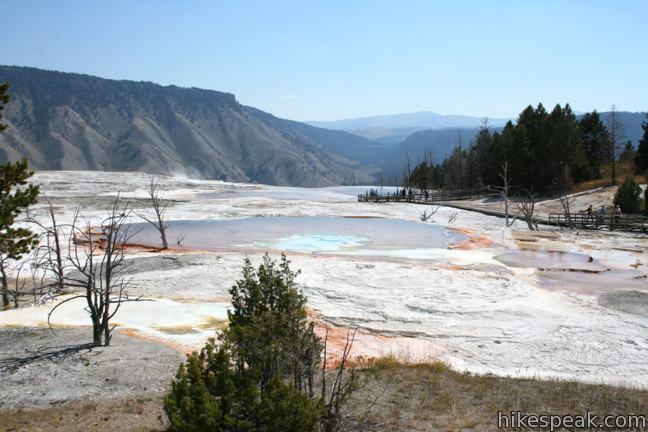 Yellowstone National Park might have a lot of must see attractions, but you should not leave the park without visiting Mammoth Hot Springs. 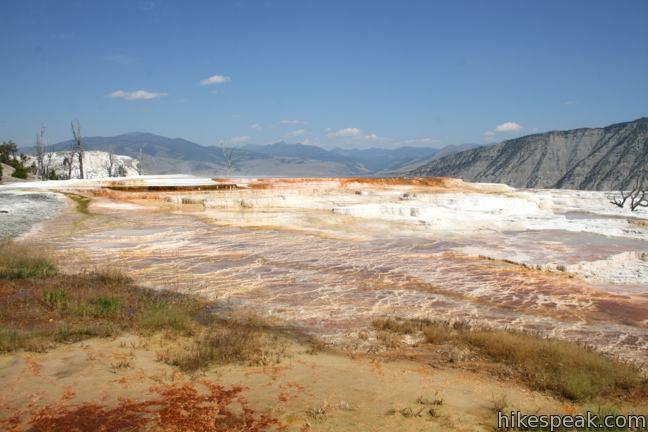 This impressive hydrothermal area may not have any high-spouting geysers, but it does have one of the world’s greatest collections of hot springs with terraces made up of travertine deposits. 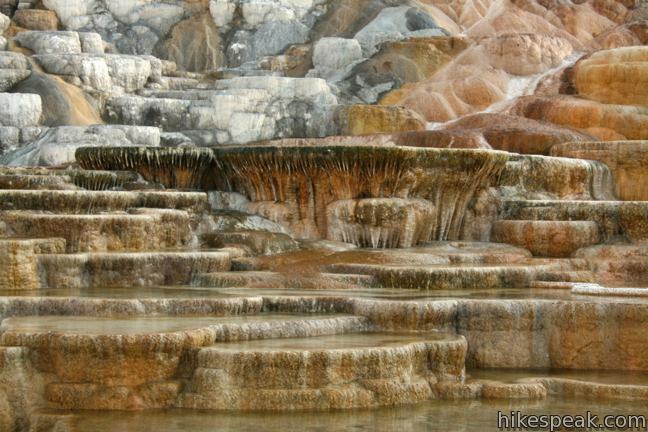 The colorful steps and pools at Mammoth Hot Springs look more like something you would see in a cave next to stalactites than anything you are used to seeing above ground. 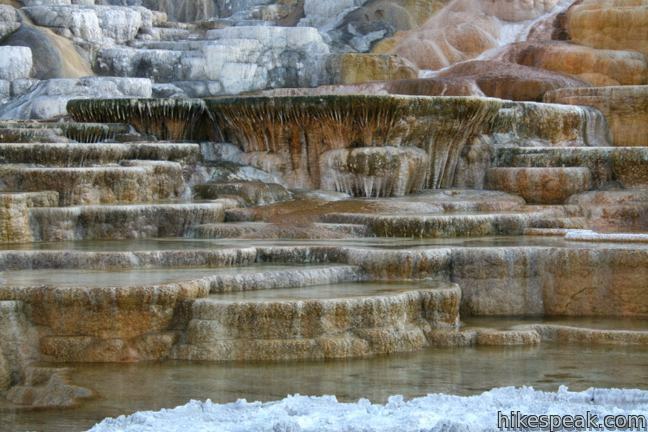 This is an active hydrothermal area, which means that the terraces and pools are constantly growing and changing. These “living sculptures” can be seen on foot over a series of boardwalks as well as out your car window on Upper Terrace Drive. 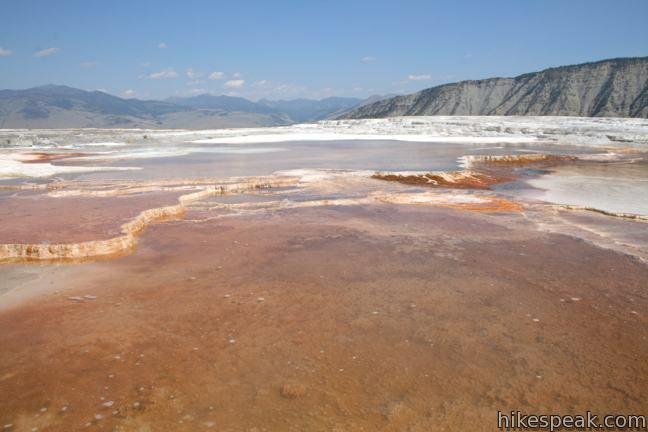 It takes a little over an hour to hike through the main and lower terraces in Mammoth Hot Springs. The boardwalks cover about 1.75 miles with 300 feet of elevation change. 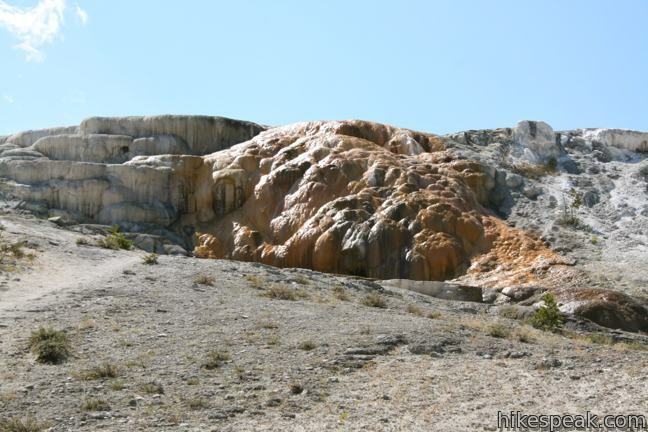 Along the way, you’ll see notable features like Canary Spring, Minerva Terrace, Palette Spring, and Liberty Cap. 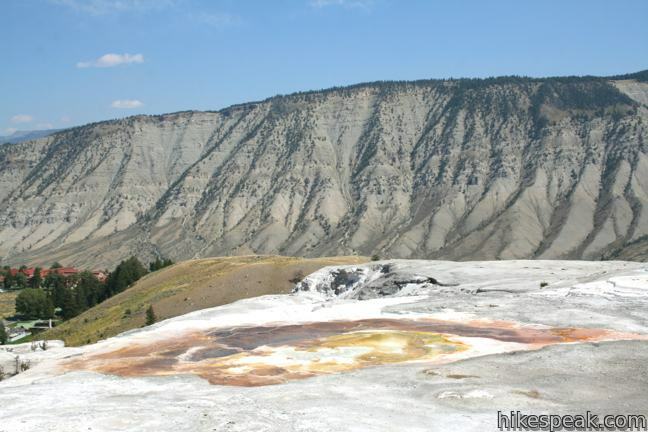 The walkways can be accessed from a parking area on Upper Terrace Drive next to the Main Terrace or from a parking area below the Lower Terraces by Liberty Cap, a dormant hot spring cone. Upper Terrace Drive is a 1.5-mile one-way loop that can be explored in your car (no buses, RVs, or trailers) or on foot. The paved circuit passes interesting features like Orange Spring Mound, White Elephant Back Terrace, and Angel Terrace. Just past the start of Upper Terrace Drive is a large parking area. Pull over and get out to walk through the terraces on park-provided boardwalks. Venture into the Main Terrace by heading to the right from the parking area along Upper Terrace Drive down a few steps to Grassy Spring. 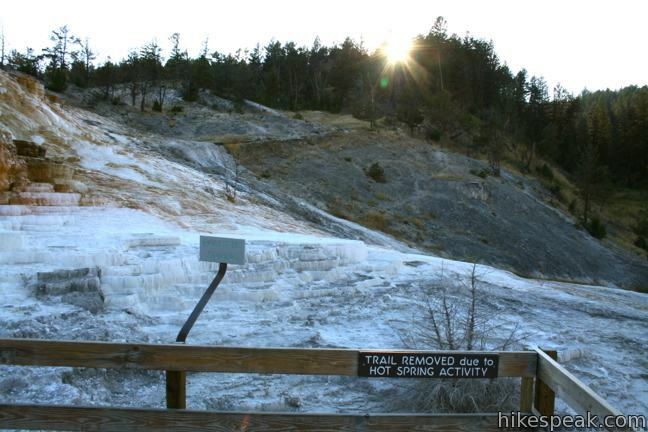 Hot water flowing beneath the plank walkway makes it immediately clear that Mammoth Hot Springs is alive and active. 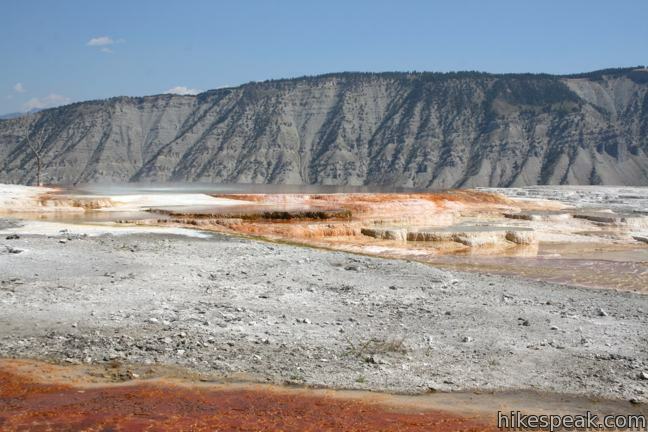 Grassy Spring bubbles above the boardwalk and spills down a surface of rippled orange travertine deposits. 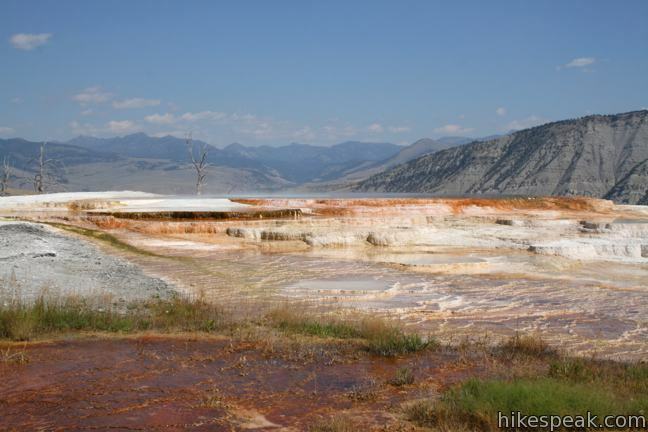 Thermophiles, microorganisms that love heat, are responsible for the rich color of Grassy Spring and other hydrothermal features in Yellowstone. Yellow marks extremely hot water while greens and blues typically mark pools cooler than 140 degrees Fahrenheit. 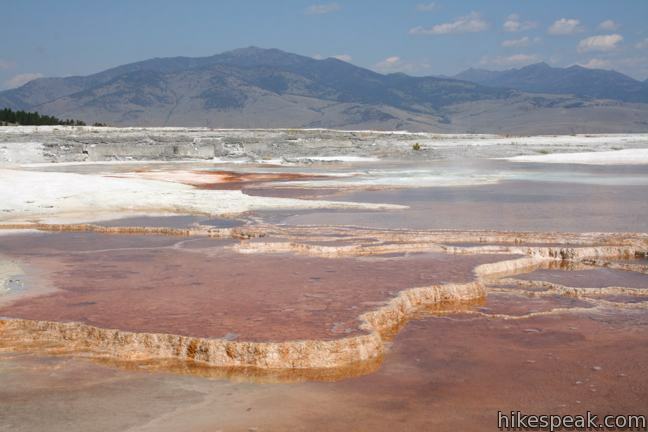 Science break: How are the terraces formed? 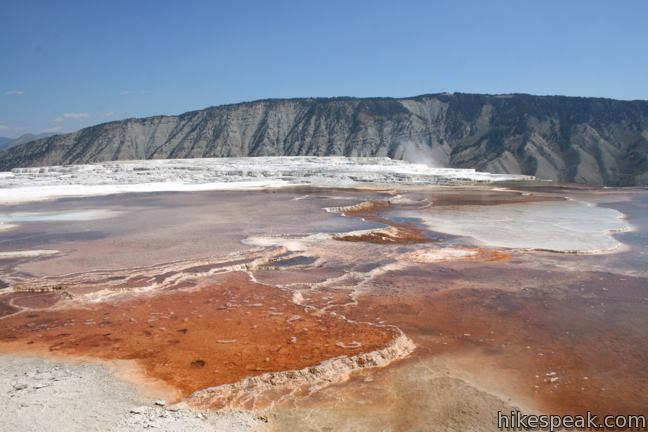 It starts with water from rain and snow that sinks into the earth and meets a geothermal heat source like a magma chamber. 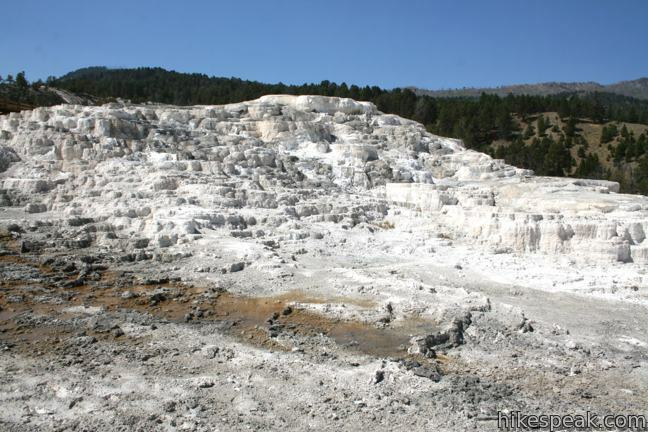 The liquid boils and rises to the surface, mixing with carbon dioxide, which dissolves calcium carbonate from the limestone. The water bursts forth above ground, transplanting the mineral to the surface. 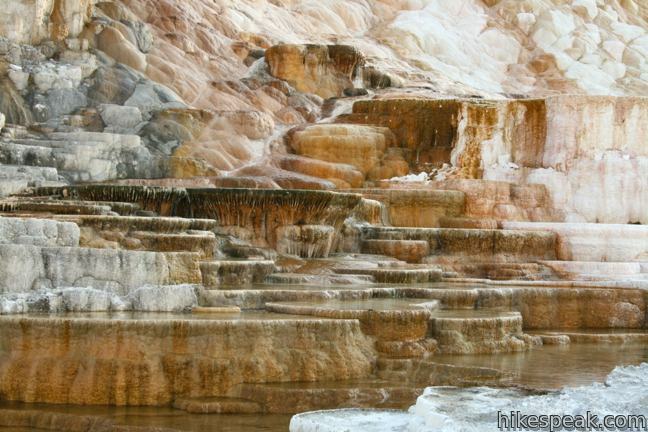 As the water cools, it deposits the calcium carbonate in thin layers that build up over time in the form of otherworldly terraces. 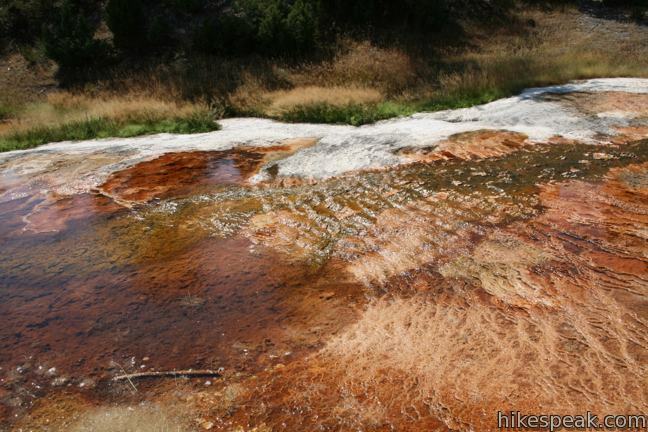 Below Canary Spring are the circular terraces of Trail Springs and Canary Spring. 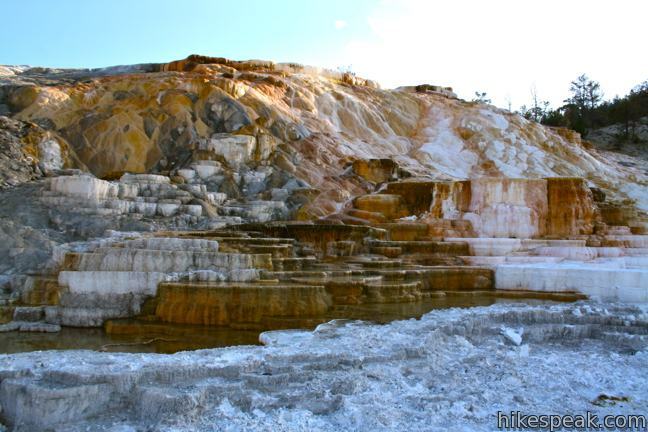 The quarter-mile long stretch of boardwalk that you are on ends at the edge of Canary Spring, where awesome white and orange terraces drop some twenty feet. Steaming water flows down the terrace, a sign that Canary Spring is still growing and is actually overtaking trees and a few inches of the boardwalk. Return to the parking area off Upper Terrace Drive and hike in the other direction. A short flight of steps leads to an overlook of New Blue Spring just before a boardwalk that descends to a loop through the Lower Terraces that can be covered in 3/4 of a mile. 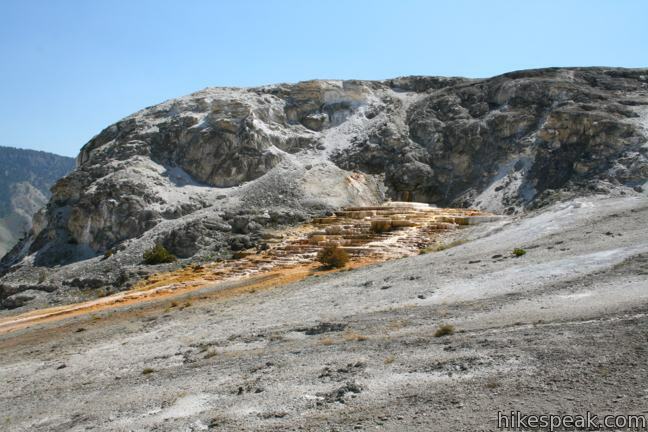 Hiking counterclockwise, the trail passes Mound and Jupiter Terraces, rounds Minerva Terrace, looks down on Palette Spring, and ends by circling past Cleopatra Terrace, a proud orange feature that stands off by itself. 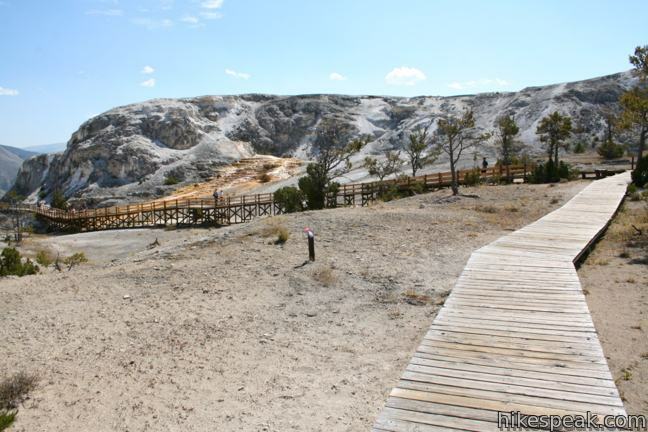 The loop around the Lower Terraces can also be reached from below via boardwalk staircases starting from parking areas alongside Liberty Cap. 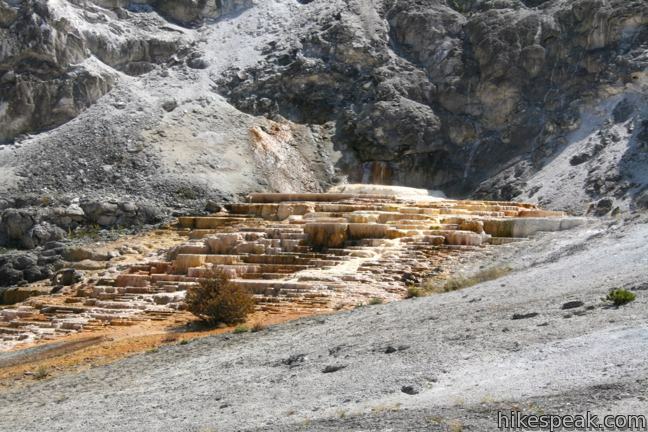 You may hike down to Liberty Cap and Palette Spring via these steps, or start your hike from the bottom and work your way up to the Lower Terraces and on to the Main Terrace. 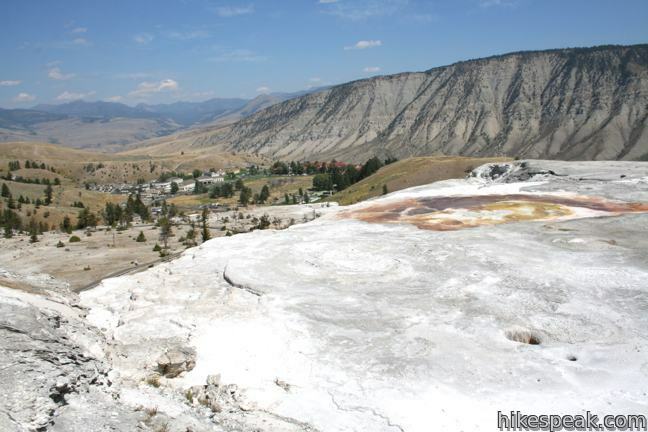 Those starting from the top may wish to return to the parking area on Upper Terrace Drive and then drive down to the parking areas next to Liberty Cap for a quick look at the features at the bottom of Mammoth Hot Springs. 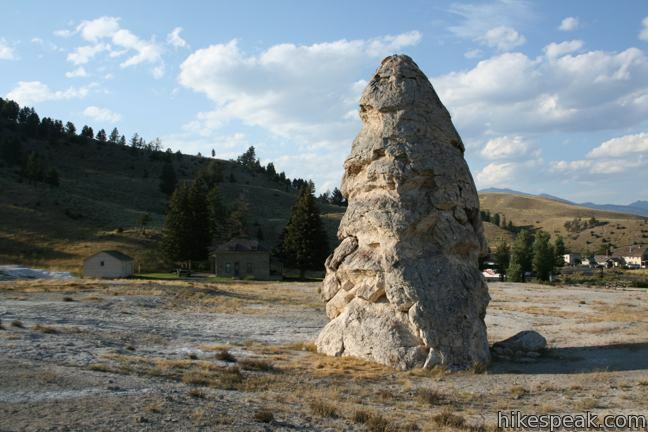 Liberty Cap is a 37-foot tall cone resembling an oversized garden gnome at the base of the terraces. 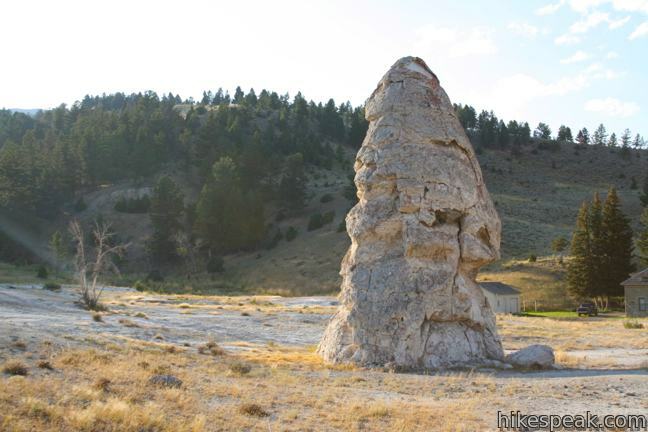 Liberty Cap stands just off the main road into Mammoth Hot Springs, making it easy to visit. 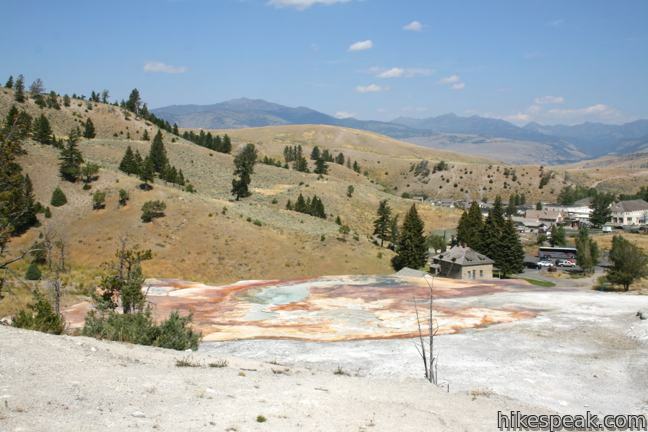 The cap is a dormant hot springs. 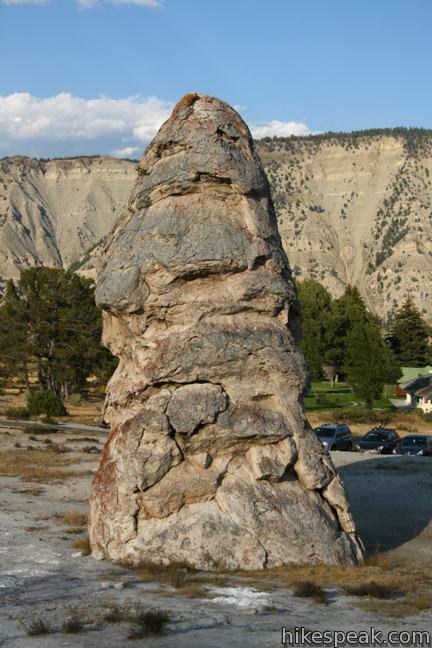 Active in eons past, a vertical chute of water spent hundreds of years building up thin layers of mineral deposits, eventually forming the shape of a cone. 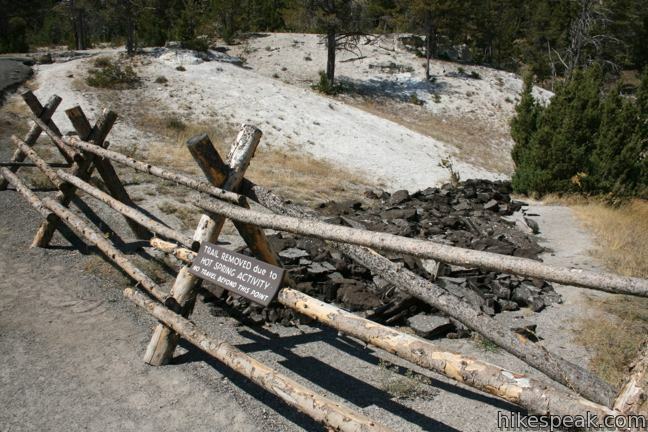 A boardwalk leaving from a parking area near Liberty Cap passes the feature after a couple hundred feet en route to a viewing platform for Palette Spring. 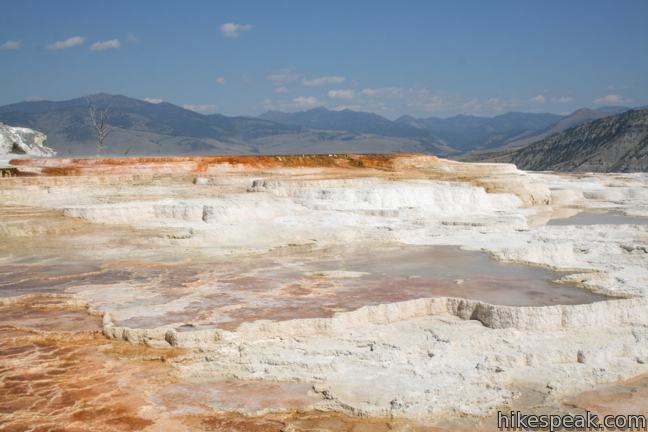 Palette Spring is one of the most striking features of Mammoth Hot Springs. 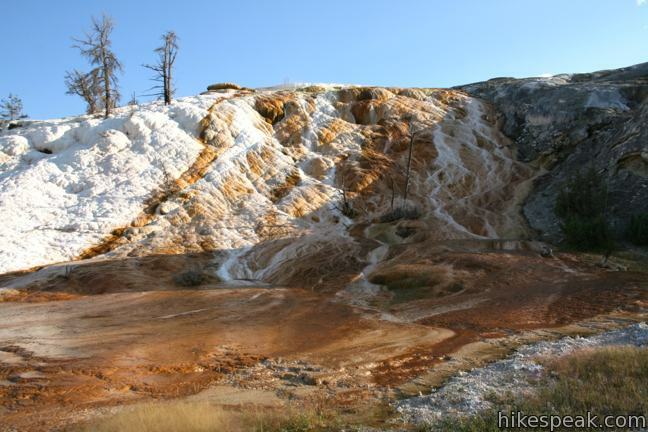 One part of the terraces below the spring resembles skier’s moguls, with smooth white, orange, and brown bumps created by a crisscrossing flow of water from Palette Spring. 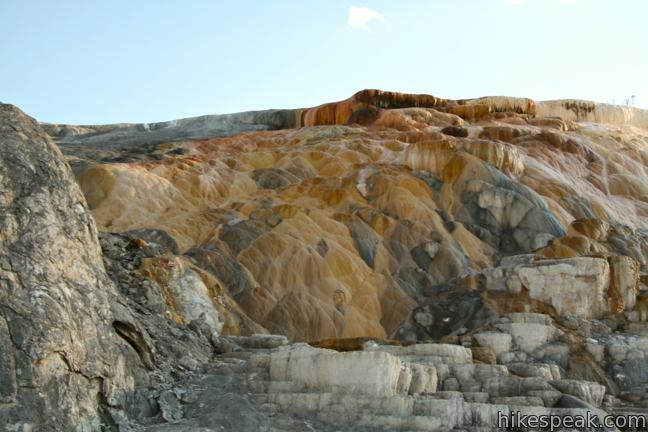 Other orange, pink, and white terraces look as though they might be covered in ooze. 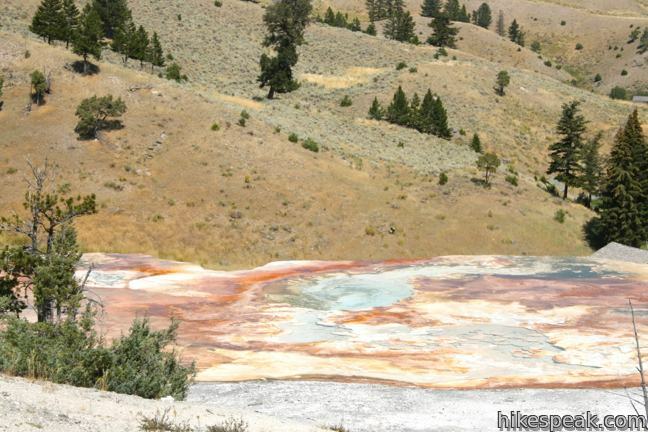 Complimented by the adjacent Devil’s Thumb (a dormant hot spring cone), Palette Spring looks both monstrous and beautiful. 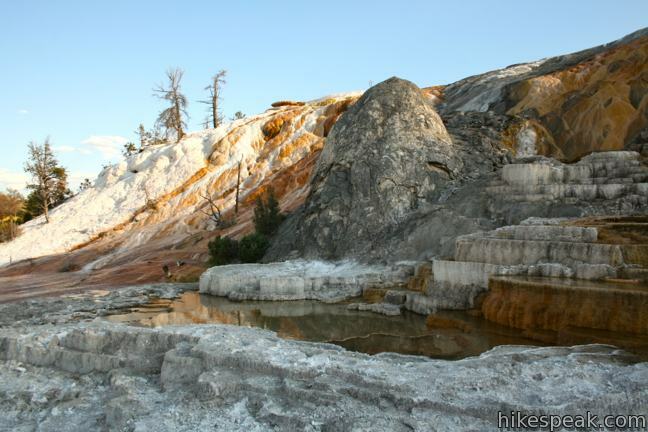 The terraces at Mammoth Hot Springs are a distinct experience from the geyser basins in other parts of Yellowstone. 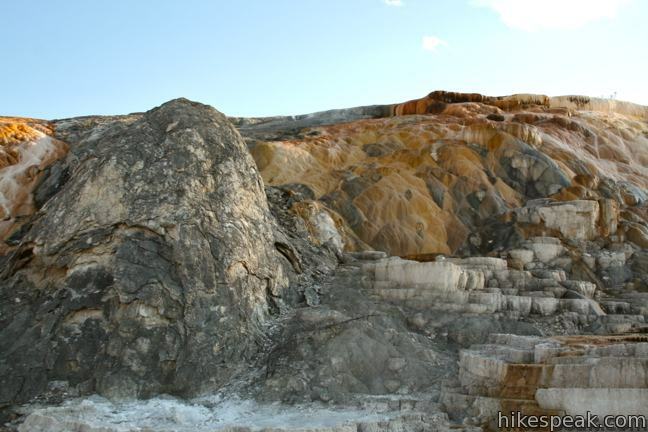 The bedrock of limestone at Mammoth Hot Springs, which is not common elsewhere in the park, has provided material for centuries of slow building mineral terraces that are absolutely astonishing to observe. 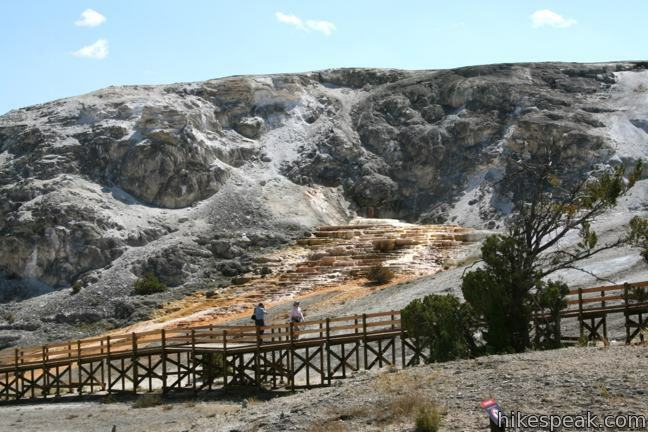 Mammoth Hot Springs is a park highlight, located in the northwest part of Yellowstone away from notable attractions like Old Faithful and the Grand Canyon of Yellowstone. 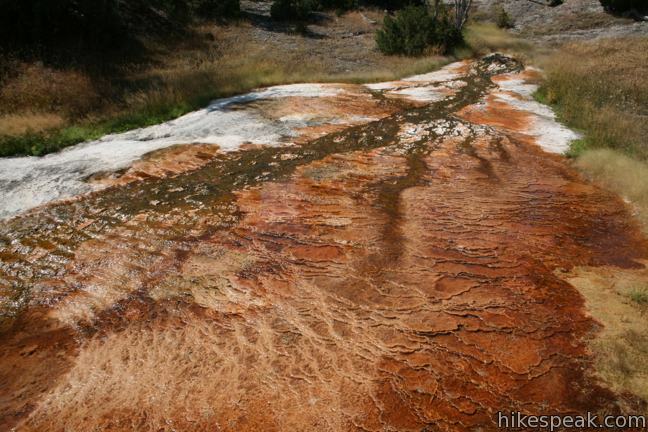 If it is a nice day, put on a bathing suit and take a hike to Boiling River, a nearby swimming hole where a stream of hot hydrothermal runoff mixes with cold river water to form an only-in-Yellowstone hot springs. 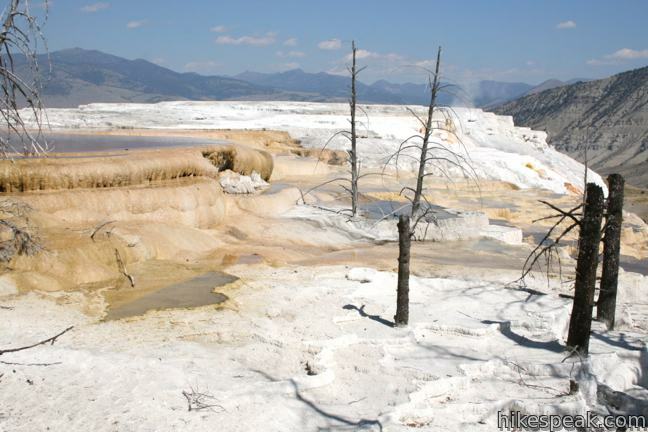 Yellowstone National Park has an entrance fee, but no permit is required to hike through Mammoth Hot Springs. 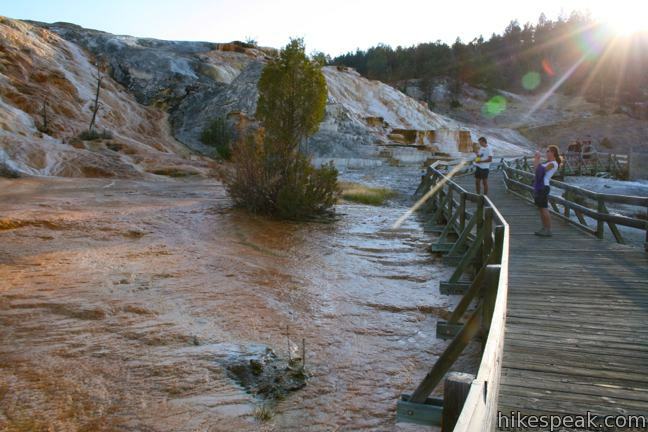 Stay on the boardwalk and do not touch any hydrothermal features (or throw anything in). 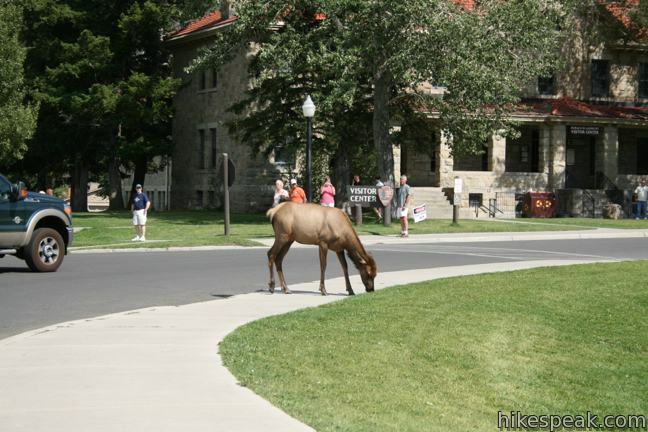 To get to the trailhead: From the Roosevelt Arch at Yellowstone’s north entrance near the city of Gardiner, Montana, drive 5.7 miles south on Route 89, passing the Mammoth Hot Springs Hotel and the Albright Visitor Center to reach the parking area for Liberty Cap on the west side of the road. Continue another 1.7 miles south up a horseshoe bend to reach Upper Terrace Drive (also on the west side of the road). Enter the loop and turn right to reach the parking area for the Main Terrace boardwalks. 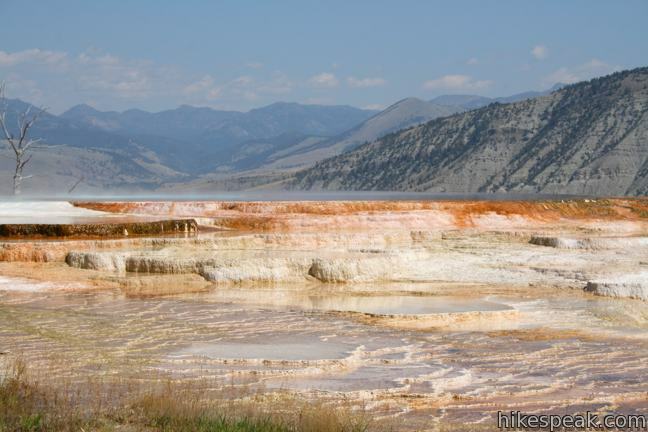 If you are traveling to Mammoth Hot Springs from the south, drive 19 miles north of Norris Canyon Road on Route 89 (Grand Loop Road) to reach Upper Terrace Drive. 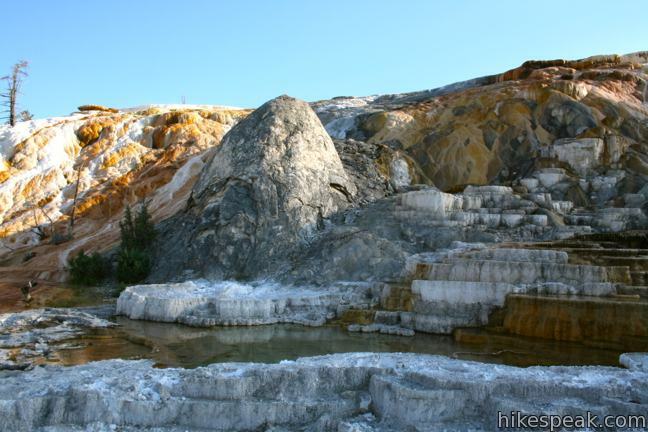 This 1.25-mile round trip hike follows a riverbank to a natural hot tub where a stream of water cooked by nearby hydrothermal features mixes with the river. 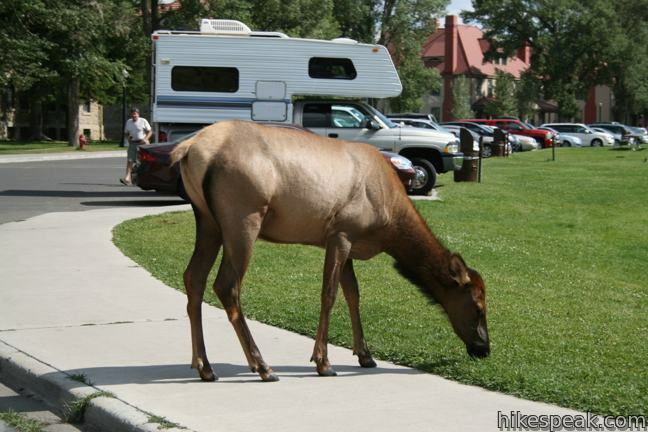 Twekve developed campgrounds with over 2,000 total sites are spread throughout Yellowstone. You should find parking for a truck and trailer below the Lower Terrace (to the north). 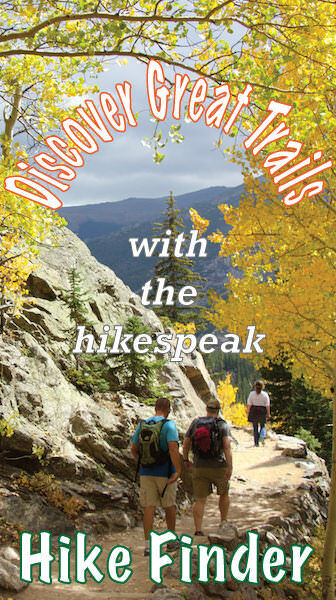 Are the trails/boardwalks able to be hiked on with a walker? No words to thank you. 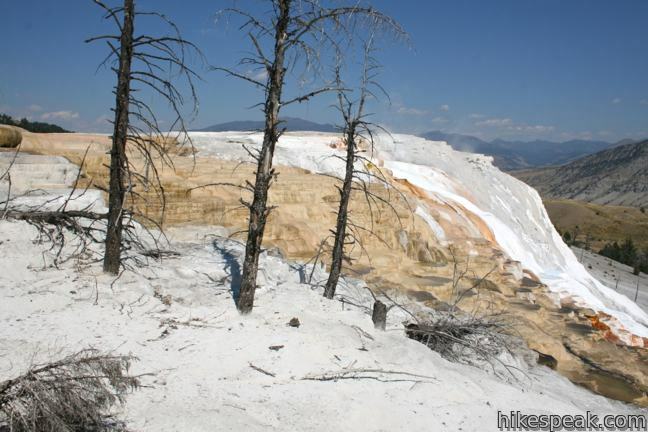 We’re planning a trip to Yellowstone and we again came across your articles – which we have seen and used on previous trips. We can’t express how helpful this is. No other as detailed and clear as this! We know and can imagine how much work goes into these reports so we just want to thank you again and again! THANK YOU! Keep up your amazing work! And thank you for the very kind words and your readership! 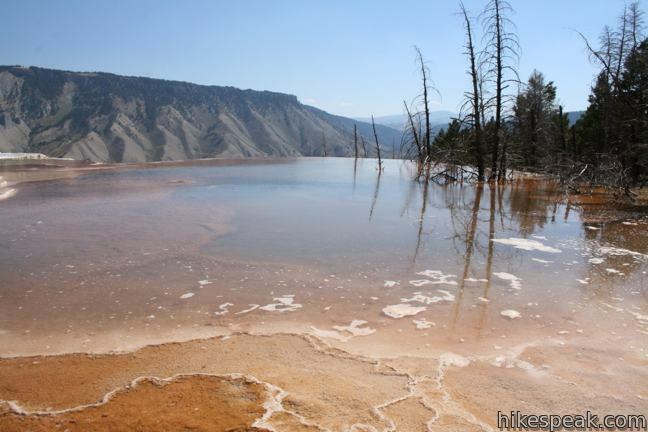 Happy to know that hikespeak was able to help you enjoy Yellowstone!